The Yamaha EF2000iSv2 Portable Inverter Generator is actually an improved version of the Yamaha EF2000s and the EF2000iS. The word “i” stands for inverter which means this unit is installed with an inverter which is specifically a hardware with circuitries that convert direct current (DC) to alternating current (AC). The v2, simply means it’s the second version of the EF2000iS so this type of Yamaha’s portable generator is categorically a higher version from its predecessors with a wider range of applications at much longer time. 1 What Can You Expect from the Yamaha EF2000iSv2? 3 How much power can it put up? 4 How long can it keep up? 5 What about the engine and capacity? 6 What are the improved features? 7 How do you use the Yamaha EF2000iSv2 portable inverter generator and maintain it? 8 What are its safety features? 9 Can this be used to power tools? 10 How loud is it? 11 How about its portability? 12 How economical this unit can be? 13 Is this waterproof or water resistant? 14 How can you protect it outdoors? 15 Would it be alright to use it during thunderstorm with a shade on it? 16 Where exactly the right place to leave this unit while running? 17 Does it have a warranty? 18 What other advantages I could get in owning a Yamaha EF2000iSv2? What Can You Expect from the Yamaha EF2000iSv2? The Yamaha EF2000iSv2 portable inverter generator has really a lot to offer. If the speed of the conventional portable generator engines normally varies, the current that they produce can fluctuate which can result in wrong frequencies. So anything that receives power from these generators can have the risks of getting damaged. The bad news is, if highly sensitive gadgets are connected to it, the possibility of permanently damaging their hardware or programs becomes greater. 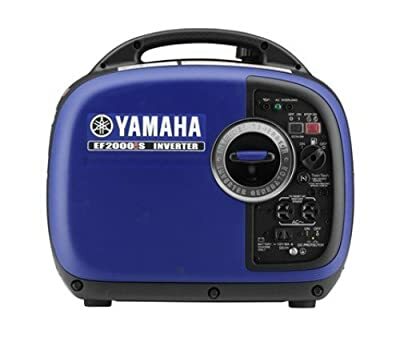 The Yamaha EF2000iSv2 portable inverter generator, on the other hand, has a rectifier and capacitors that do the inversion so that the AC that it produces gets converted into DC voltage and then inverted to AC again. This process produces a current that is more refined, more stabilized and clean there’s no probability your electrical tools, equipment or even sensitive electronics that draw power from your EF2000iSv2 will be affected. To give you more detailed specifications of this unit as well as the benefits you can get from it, we put up this Yamaha EF2000iSv2 review. We have also included some of the most frequently asked questions about the unit and provided answers to it. A whole lot improvement from the EF2000 versions. With inverter to produce cleanest power to protect sensitive gadgets. User-friendly. Comes with an instruction manual (operation and maintenance). Lightweight weighing only 44 pounds. Very portable and with extra large handle. Very versatile. Can be paired with any EF2000 model to produce higher amps when heavier load is required. No need for tools to refuel or drain gas/oil. With auto warm up during startup at 2000 watts to be safe from big loads. Equipped with a 75cc Yamaha engine with smart throttle for fuel economy. Solid construction with robust features. Safe even for highly sensitive gadgets. Ideal for outdoor needs: RV, hunting, fishing, camping, job sites or ranch. Best choice for areas with constant blackouts. How much power can it put up? The Yamaha EF2000iSv2’s normal running power is 1600 watts but with a maximum of 2000 surge wattage. This means that you can adjust its throttle depending on the appliances you will be using. For larger appliances like air conditioners or if you’ll be lighting up your house and plugging in few small appliances, you can adjust its power load whenever necessary. This unit has an AC output of 13.3/16.7 amps at 120 volts. The good thing about this unit’s inverter feature is it only produces safe, clean and reliable power that is refined. So even your small electronic gadgets that have high sensitivity to currents like cellphones, plasma TVs and laptops, these will be safe from surge damages. With an advanced controller and programming, this makes the EF2000iSv2 portable inverter generator the capacity to load up wide range of applications so this is much an advanced version of the previous EF2000iS versions. How long can it keep up? The EF2000iSv2 has a full fuel capacity of 1.1 gallons and uses unleaded gas. If only 25 percent load is used, this can last up to 10.5 hours. This is because this unit uses a smart throttle feature that automatically adjusts its gas usage based on the load. This fuel economy feature also reduces the noise that users say you can converse with someone even you are near it and won’t get bothered. For a full load and continuous run, it is assumed that this machine can run from 3 to 3.5 hours assuming that an air conditioner is powered by it. But for regular lighting use with smaller appliances running, a full load can last for an average of 8 hours. If you want to extend its running time, you can quickly reload fuel and oil but it is recommended that you rest it for about 30 minutes to let it cool down after a full load running. You can also buy an external tank which you can connect to the generator so that when the original tank gets empty, you got another tank coming quick. This avoids downturn time during refueling. What about the engine and capacity? This inverter generator is packed with an air-cooled OHV 79cc, four-stroke, single-cylinder engine. It is capable of producing 1600 watts up to 2000 watts. Due to its capacity to adjust to varying load, it can protect itself from surges when powering large appliances. And because of its inverter system with Pulse Width Modulation (PWM) control, any electrical or electrical devices that you connect to it can be safe. With its smart throttle, there’s no possibility of overloading, current fluctuation or producing varying degrees of frequencies. What are the improved features? With an auto-decompression system that reduces compression, this unit is very easy to start. And once it starts (pull-cord start), it automatically goes to auto-warm up. The smart throttle also enables the engine to detect load and adjust itself to put up enough current. If the load goes above its capacity, its internal breaker will kick in and shut down the machine to prevent engine damage. For the control, the EF2000iSv2 portable inverter generator has an easy access front panel and fuel gauge that would allow you to see fuel level at a glance. It also features two 120 AC and one DC outlet (8amp 12 V) for charging car batteries or laptops. On the other hand, you can also connect this unit to other generators of the older models like the EF2000 and the EF2000iS versions if you want additional 30 amps power. All you need is to have a Twin Tech Cable to connect them. Watch this video to learn how to do the connection and how to connect the power cord to your home’s electrical system. How do you use the Yamaha EF2000iSv2 portable inverter generator and maintain it? As a pull-start machine much like mowers and chainsaws, operating it is very easy. You just pull out the cord in a jerky motion and the engine kicks to life quickly. If you want to learn more about using it and discovering about its engine, check its manual that comes with the generator. You will also learn how to troubleshoot and maintain it. When refueling, you also need to check the oil level and make sure the recommended engine oil reaches the right level. But in case the oil level goes down too low, the engine will automatically shut down to prevent engine problems. You must also be aware that gas and oil have separate tank as in the case of all four stroke engines. Yamaha recommends 10W-30 or 10W-40 oil. Its oil tank can hold up to .4 L (.42 US quarts). Turning the engine off is also a breeze. First, turn off all the electric devices that are powered by the generator. Then turn off the “black economy switch” and disconnect all the devices. Switch the red switch to “stop”. For the gas, don’t forget that this only requires unleaded gas and no need for methanol mix. The unleaded gas can make the engine last longer because this is out of impurities thus there’s no need for methanol to get maximum performance. For further maintenance tips, here’s a video on how to totally maintain the Yamaha EF2000iSv2. When it comes to safety features, the Yamaha EF2000iSv2 portable inverter generator has a lot. It has an oil watch warning system that will tell you when it is low on oil. Insufficient oil may cause damage to the engine if not properly sustained. However, if the oil gets too low with this generator, it will automatically shuts down its engine. With other brands, this is non-existent thus causing owners a lot of money on repairs. It also has an electrical overload protection system so if there’s an overload due to too many appliances sucking up current, its circuit breaker will automatically trip off to prevent damage to generator’s engines and components. It also has an auto-decompression system that eliminates compression but enhances easy startup. Moreover, this unit is also EPA and CARB (California Air Resources Board) emission certified. This means that since EPA approved this for its clean emission, it is safe to use on all 50 US states. And with California having a unique emission standard, the EF2000iSv2 also passes CARB’s air quality emission test. Can this be used to power tools? This is one question that a lot of people want answers and there’s no reliable people to answer this better than those who owns and used the Yamaha EF2000iSv2 portable inverter generator. And accordingly, this portable inverter generator can power air compressors, pumps, nail guns, electric furnaces and many other power tools you normally use on workshops, car repair shops and for home repairs and construction. People who want to have portable generators for home and outdoor use generally prefer the quiet ones and this one is really a very quiet generator. It is equipped with a super quiet muffler and USFS approved spark arrestor so it doesn’t sound like it is burning gas inside. Tested, it gets a sound rating of 51.5 to 61 dB during ¼ load. So if you are camping on a site where there are restrictions on sound level, using it on ¼ load for your RV or tents or for mobile appliances would not pose a noise problem. This machine has a dimension of 19.3 inches x 11 inches x 17.9 inches. Simplifying its overall compactness, this is around 2.2 cu.ft. and weighs only 44.1 pounds. It’s like carrying a small luggage but a bit heavier because of its solid construction and metal components. You can easily stack it inside your car’s compartment, boat’s cabin or in your garage without taking so much space. With its solid hard plastic construction housing, there’s no risk of damaging its internal components when traveling with it. But when stacking it among large equipment, just make sure its front controls are well protected. This generator is also integrated with a wide, comfortable handle for easy transport. As long as you need a reliable power generator for 120 volts source, this one can be reliable. How economical this unit can be? As mentioned, the Yamaha EF2000iSv2 portable inverter generator is featured with a Smart Throttle system that automatically adjust its engine speed according to load. So basically, this system is programmed to adapt its engine speed depending on how much current is getting sucked up by your appliances, light bulbs, gadgets and so on. So even when there’s a higher load requirement, there is still an improved and efficient use of fuel as the system itself refines the current output and that minimizes fuel consumption. Is this waterproof or water resistant? No, this is not designed to resist water even though it is encased in a robust and solid casing. Once water seeps in between the housing’s crannies, this may ground the hardware and may damage some internal circuitry. The owner’s manual also warns that this must not be left out under the rain. How can you protect it outdoors? You can make its own protective house like a dog house with good ventilation. We don’t recommend using a child’s playhouse if you still have a child that may get interested to play with it. But if there’s no child in your household, an old playhouse would serve a good shade. This machine can get very hot when it’s used for long hours. And because it uses gasoline, you have to be aware not to put it under a very hot sun even with its own shade during longs hours of use or else it may overheat and malfunction. Would it be alright to use it during thunderstorm with a shade on it? Not really. Water from strong rain can seep in through the ventilation or between crevices and this may get into your hot generator. More problems can happen if water gets inside the generator’s engine and hardware. Where exactly the right place to leave this unit while running? Note that, it is not advisable to run your generator inside your house or even in your garage regardless of its ventilation. All generators including the EF2000iSv2 produce fumes and exhaust that cause carbon monoxide poisoning. The best place would be any place around 30 to 50 feet away from your home so that no fumes would get in. Also, air should not be blowing towards your home or neighbors’ homes and its shade’s ventilation should not be facing any home. Although the Yamaha EF2000iSv2 portable inverter generator is known for its durability, it comes with a 3-year limited warranty. However, if you want to ensure your unit will really be under an effective warranty, better call the company’s customer service hotline and inquire. According to some users, the warranty only covers the machine if it will be used for residential or non-commercial use. So if you plan to use it for commercial use, better call the company’s customer service and clarify. Take note that Yamaha will not provide warranty if damages or failures is due to neglect, abuse or damages due to accidents. Or if you usually use it near the beach where air is salty which can cause corrosion to the engine, this will not also be covered. What other advantages I could get in owning a Yamaha EF2000iSv2? If you are considering getting a portable generator, you may check out products online and find lots of them. But with all the goodness you can see in them plus the good reviews backing them up, choosing would be hard. However, the Yamaha EF2000iSv2 portable inverter generator is no ordinary compact mobile generator. This one will meet your purpose and can give your money’s worth. So here are the benefits. Your reliable power generating unit in time of natural disasters. Any disastrous phenomenon that could strike us anytime like hurricanes, strong typhoons and floods, these could ultimately darken our world and who can live in total darkness and with appliances rendered useless? If you have a business going on and power outages strike in, there goes your loss. How can you use your computers, printers, routers and other office machines without power? Or how about your freezers, heaters, flashlights and cellphones when their batteries run dry? With the EF2000iSv2’s smart throttle feature you will also have a peace of mind because you know your gadgets will be safe as they charge. Everybody needs electricity. We charge flashlights and gadgets or to power up portable refrigerators during camping, RV vacation or cruising. With a reliable portable generator like the Yamaha EF2000iSv2 portable inverter generator on the reach, this will cover your needs. It can be your reliable power source companion always. And even this is within your vicinity this won’t bother you in your sleep. Constructing or renovating your home or putting up or repairing your fence in your farm with no source of electricity to power your tools? This unit will cover you. Anything from small pneumatic to hydraulic tools as long as its power requirements don’t go beyond the 2000 watts, this small beast can power them and charge their batteries. Want to throw a party in your backyard or outdoors? If your extension cable is short. Or with no power source for your outdoor party, the EF2000iSv2 can power up for your bulbs, portable freezers and fans. The Yamaha EF2000iSv2 portable inverter generator doesn’t come without flaws as all machines normally develop through time of use. But this one has only few which we have found on some reviews. For one, a number of owners say this unit consumes oil like it’s gasoline. We don’t really know what types of oil they have used but one reviewer said this happens to his unit after using it for years. So the probable culprit is age and maybe lack in maintenance. More so, this is now becoming a common problem. While the issue is out there better use oil that is highly recommended. Change oil as necessary and try to check and maintain the oil level accordingly. Another user says this machine requires high altitude carburetor kit to function normally on high elevations. Although this is an unusual concern, this issue must be taken seriously by Yamaha. This generator is for public’s purchase. Therefore, people regardless of where they live must know its weaknesses. The pull-cord starter is also a small issue that few owners have to deal with and the problem is hard starting. Other than these, no big problems have been reported against the product. The Yamaha EF2000iSv2 portable inverter generator as we have reviewed comes out still clean, very reliable and efficient. We like its innovation that has really improved the overall performance of the EF2000iS models. If you’re thinking of buying a portable conventional generator, it will be a good idea to check this out first. What’s the difference between the conventional and the inverter generators? Well, in terms of size and weight, they almost have the same compactness and weight. The only possible difference would be their watt capacity. And with regards to generators, the heavier the machine, the more powerful this could be. When it comes to efficiency and run time, the inverter generator is more fuel efficient. This is because it can adjust itself based on the requirement of the power load. It also has a smaller tank while both can have the same run time during continuous load. They can also power up the same appliances. The inverter though producess less noise especially the EF2000iSv2 as it is equipped with a super-quiet muffler. On the category of power output, conventional generators have wattages ranging from 500 up to 50,000 watts or more. Inverter generators have more limited range which is from 1000 to 6500 watts. However, when it comes to the quality of power being produced, the power output of the inverter doesn’t fluctuate. It also produces smoother and cleaner current. This is due to its rectifier that converts AC power to DC voltage and inverted to AC again. You want a powerful, compact and reliable power generator that you can use on so many applications? The Yamaha EF200iSv2 portable inverter generator could be your perfect choice.